The Wallowa mountains are located in the northeastern part of Oregon and are part of the Columbia Plateau. The Wallowa Batholith is formed of granite from a magma upwelling in Late Jurassic and Early Cretaceous time. The placement of this rock caused uplift of the surface, which at the time was tropical sea. There is no doubt that the Wallowa mountains offer some of the most amazing scenery anywhere located in the lower 48 states. It has the second largest roadless wilderness in the lower 48 and it boasts 37 peaks over 8,000 feet. There are endless amounts of hiking trails throughout the wilderness and you can expect to see some of the most diverse ecosystems and wildlife anywhere. However, if you want to explore the Wallowa’s, you will want to plan on bringing your A game! The trails are very steep, long and very strenuous. The entire wilderness area is a backpackers dream but if you are only planning a day trip you will want to study your options very carefully since most of the mountain lakes are over a day hike away. You literally will be pushing your athletic limits just to get to your destination and then you have to hike out again. There are some really good books that will show you all of the hundreds of trails available and then you will just need to decide on your route. 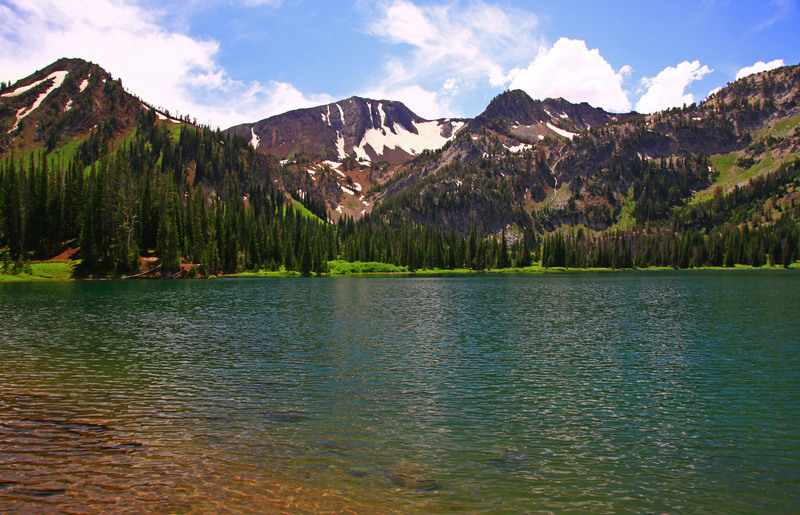 The most popular place in the wilderness is right near Wallowa lake state park. The park offers one of the best campgrounds and there are several lodges, yurts and cabins. Most of the backpackers start from this spot since there are a lot of parking spots available and it seems to be the most popular place to start. In fact, most of the best trails start from here and when you get back to your car there are plenty of places where you can immediately get some food or find a place to wash up or crash. I’ve camped at the park several times but I have never backpacked so I have spent a lot of time researching the best trails to start from in order to take advantage of the best things to see and do. However, you will want to keep in mind that if you find a trailhead that you want to start from you will want too keep in mind that most of the forest roads that take your desired spot are very rough and you may need a rig that has a high clearance and possibly 4 wheel drive. Again, this is rough country and the only place where you can avoid the need to go off road to find a trail is from the Wallowa lake campground area. The wilderness is like a giant circle of mountains and you can enter from almost anywhere in order to start your hike but you will find that most of the roads leading to your hiking spot is very primitive and hard to get to. The photo that I posted was taken from Aneroid lake and it’s a very difficult 12 mile hike round trip. The elevation gain was 2,950 and you will feel the pain when you get back to your campsite. However, the views are epic and you will come across some of the most amazing scenery that offers too many to list. No matter what trail you decide on, you can pretty much guarantee that your destination will take you to either a lake or a nearby river. This means that you will want to pack a pair of swim trunks and plan on going for a swim if it’s warm enough. However, the rivers can and are pretty treacherous so you will want to be sure that you aren’t swimming anywhere near a waterfall. The rivers are absolutely massive and thunderous and can really ruin your day. However, there are millions of places where the rivers become very slow and calm and will literally be telling you to dawn your swim suite. You will also want to bring as much food as you can possibly carry. You will absolutely burn enough energy to fuel the space shuttle and you won’t want to have to turn around early because your food supply has gotten too low. You also want to be sure and pack a good camera since there are a lot of wildlife that make the Wallow mountains home. Some that you may see are: eagle, hawks, osprey, black bear, elk, deer, moose, fox, coyote and even wolf. I’m sure that I have left some out but you get the picture.